The high content of multilamellar liposomes, vitamin E, provitamin B5, vitamin A, vitamin C, biotin (vitamin H), Allantoin and hyaluronic acid provides the skin with moisture and protects and actively regenerates it. 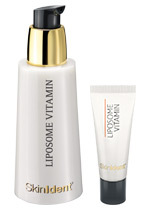 LIPOSOME VITAMIN is suitable for all skin types. It is especially recommended for prematurely aged skin which needs protection from environmental stressors as well as to be regenerated and moisturized. LIPOSOME VITAMIN has also been used successfully to treat pimples and impure skin.